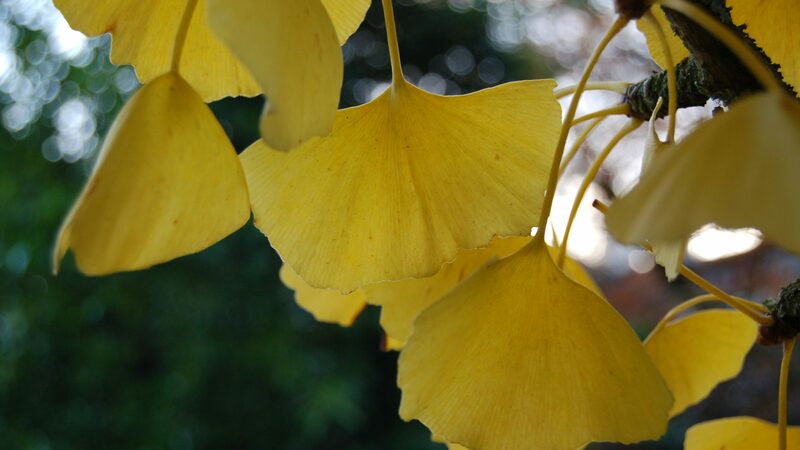 The foliage of the maidenhair tree, Ginkgo biloba, takes on buttery yellow colouring in the autumn. Ginkgo biloba is the only species within the genus Ginkgo. The leaf is highly distinctive, having a fan-shaped form, often with a notch at the apex, and with the veining running lengthwise and forking as the leaf widens. It is a unisexual species, in which only the female trees produce malodorous, fleshy, plum-like fruits. Introduced to English gardens in the 1750’s this is an attractive, slow-growing tree which takes on a pyramidal habit.